First off, let me tell you this  I think the new Street Twin looks fantastic. It looks a lot more modern than the older Bonneville, which purists might call treachery. But I think it looks pretty great. It seems like a Bonnie that has arrived in the modern age and that's a good thing. It gets a fresher more contemporary look. Pretty much everything is different, yet remains the same. It has become more stylish but still retains that old school charm. But the Street Twin isn't all about the new look. The whole bike is all new. This means that the engine and chassis are all new. The motor is a new 900cc unit that makes "more power and torque" (keep reading to find out why the quotes). It is a parallel twin like before but is now completely liquid-cooled. You might ask why the fins are there then. Well, thanks to the extra cooling from the fins, the radiator can be a rather small one. And of course, those fins are trademark Bonnie, so you can't do without them. The engine also gets ride by wire that is connected to a single throttle body. 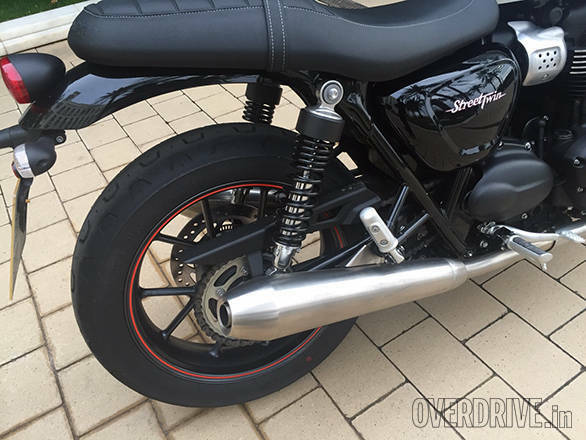 The ride by wire also lets the Street Twin have traction control. The 900cc motor makes 55PS at ,5900rpm and 80Nm of torque at 3,230rpm. If you notice, that is much lesser peak power than the outgoing Bonnie, while the torque is up by 12Nm. Before you cry foul, let me tell you about the reason behind this. 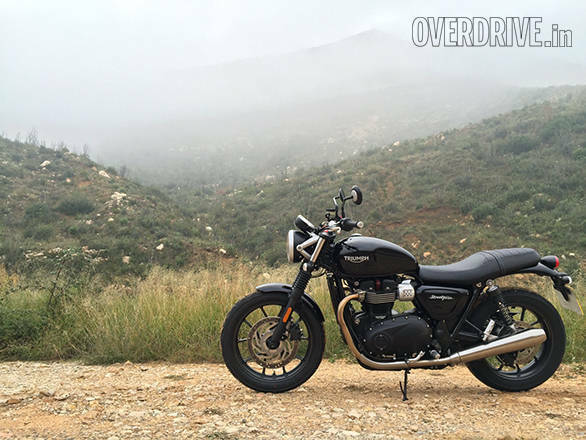 The Bonneville being the Bonneville, Triumph knows that most of the people who buy it are not going to be the type that revs the life out of the motor like us auto hacks. Most Bonnies live their entire life in the low to mid range rpm. This being the case, it made sense to pull all that power from near the redline and distribute it in the usable rev range. Which is what they have done. So essentially, the Street Twin makes 22 per cent more power at 5,900rpm than the Bonnie did at the same engine speed (hence the quotes). The result is a motor that feels way more alive in the mid range and low revs than before. Progress from standstill is quick and there is tons of torque available in every one of the five gears. Even from low revs. Of course, more power is great, but what is even better is that this power has come without any compromise in refinement. In fact, I'd even go as far as saying this new motorcycle is way more refined than the older Bonnie. There is a problem though. While the ride by wire is a very smooth unit, it is a bit too friendly. 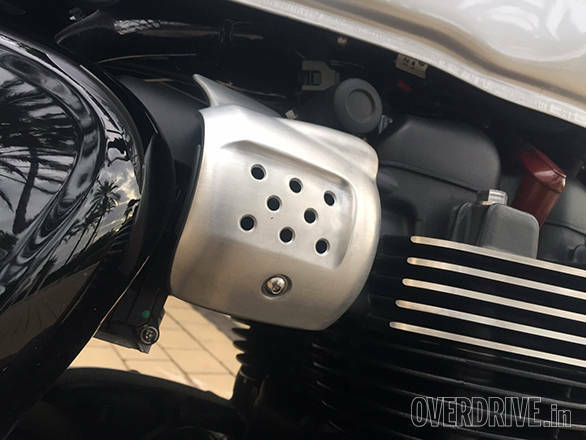 There is a bit of lag in the unit and for the first one-eighth of the throttle movement, there isn't a lot of response from the motor. So at low revs in first, and sometimes in second gear, if you make throttle corrections mid corner, there isn't anything happening initially. Then when you give more gas and you cross that threshold, the power comes on suddenly. This can get a bit unnerving at first, but after it happens once or twice, you get used to it. 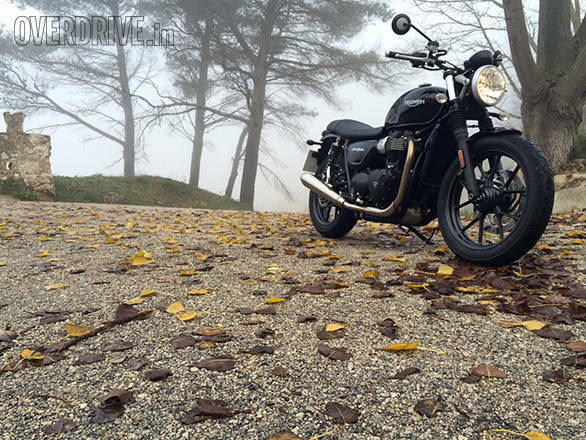 Overall, the Street Twin retains the friendliness that I loved in the Bonnie. 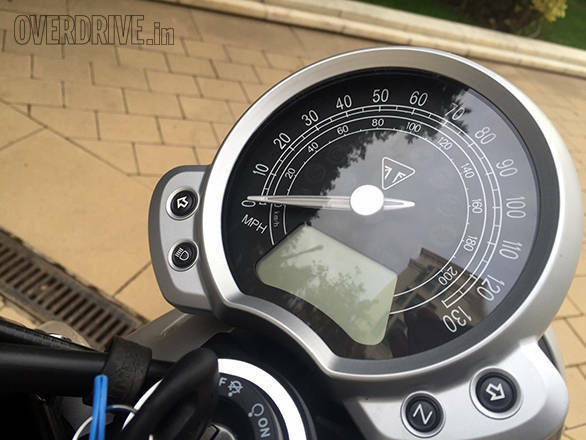 Plus, in the process of liquid cooling and updating the motor, Triumph has also managed to make the motorcycle close to 35 per cent more fuel efficient. Which is a good thing considering the tank size has gone down by 25 per cent. The Street Twin's chassis is an all new unit that has been designed specifically for the bike. Variations of this unit will be seen in the other Bonnevilles that will soon roll out. On the Street Twin though this chassis gets changes to its geometry that make it handle a lot better. The steering head angle has been changed and the wheelbase too has gone down. This, when you combine with the drop of 11kg in weight makes for a motorcycle that turns in a lot quicker than its predecessor. The suspension too has been changed. The springs are now dual rate which gives it a smooth ride over small bumps and undulations while also preventing it from bottoming out over the harder stuff. The bike gets new rubber that has been specially developed for classic motorcycles with Pirelli (which gives reasonable traction even in the wet, I must say). 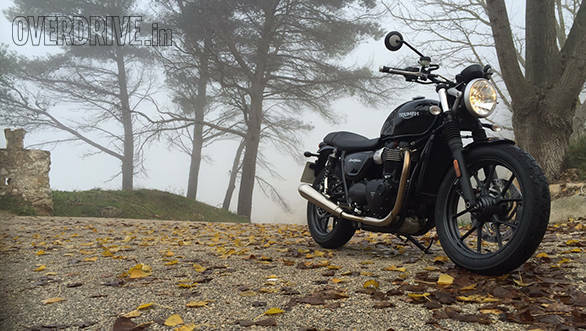 Together with the new frame and suspension Triumph has managed to retain the neutral handling of the old Bonnie but make it a lot more sporty to ride. This sportiness is carried forward in the ergonomics as well. The Street Twin has had some changes in riding position. 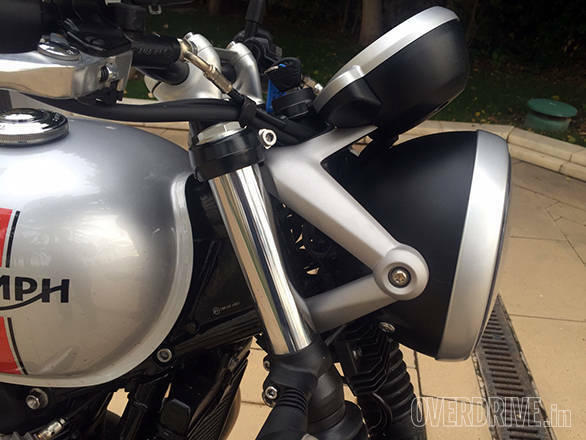 The handlebar has been moved a bit forward, the seat lower and the foot pegs are higher and more rear set. So, you end up sitting more leaned forward which is really nice. One issue I had with the old Bonnie and continue to have with the Street Twin is that the front end doesn't communicate a lot with the rider. There isn't a lot of feedback coming at you and when I really started pushing it, I found this a bit of a bother. But again, most Street Twins will not spend their lives scraping foot pegs (which the new bike doesn't do as easily as before, just by the way  yay!). But considering how well every other bit of the bike's handling is, the lack of feedback is something that I can gladly overlook. What is a huge improvement over the older bike, though, is braking. The bike actually doesn't feel all that much like a drum-braked old British twin anymore. And together with the ABS, it puts your mind so much at ease when you want to go fast. The new Street Twin, then, is a really impressive motorcycle. It feels the like the ideal way forward for the Bonnie. It stays true to everything that the Bonnie was and adds a whole lot of modernity to that mix. More importantly, as the first of the new Bonnies, it gives all motorcycle enthusiasts a lot to look forward to. If the Street Twin is really this good, I can't wait to see how good the T120, T120 Black, Thruxton and Thruxton R will be.